It was spotted in April by a government survey team counting the caribou population in the remote Wells Gray Provincial Park, in British Columbia. A group of cave specialists and geologists took a closer look at the discovery in September. They said the cave “promises a dramatic new chapter in the story of Canadian cave exploration”. Government biologist Bevan Ernst, who was on the caribou survey team, unofficially dubbed the discovery “Sarlacc’s Pit” because it looked to him a bit like the lair of a Sarlacc, a fictional creature from the planet Tatooine featured in Star Wars. “We were looking for caribou, not caves,” Mr Ernst told the BBC. He said helicopter pilot Ken Lancour was the one who thought the deep, snow-filled pit they had spotted was worth bringing to the attention of provincial parks officials. Mr Ernst said the hard-to-access cave is in a region that “is about as remote as we get” and is near where the park’s mountainous landscape transitions into “glacier-type country”. He suggested it might not have been previously spotted because it would usually have been covered with snow or avalanche debris when the team did their annual census. Geologist Catherine Hickson and cave specialist John Pollack led the 9 September reconnaissance visit for a preliminary exploration of the cave after reviewing photographs and satellite images of the feature. The entrance of the cave is 100m (328ft) long by 60m (197ft) wide – about the size of a small football pitch or a National Football League football field. 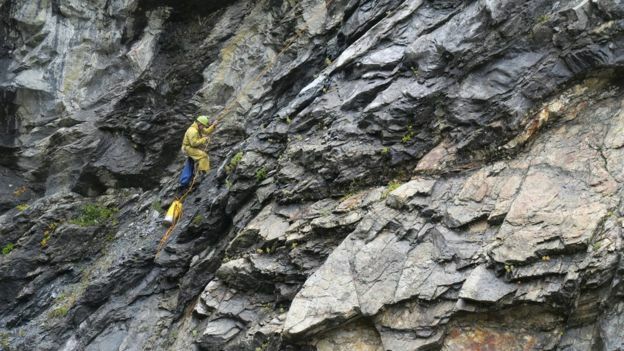 The team believes that the cave is at least 180m deep, but were prevented from formally measuring the depth due to mist from a “turbulent” river that flows into the cave entrance. Researchers say the dimensions are unprecedented in Canadian caving history. Ms Hickson told the BBC that standing next to the cave’s massive entrance was “awe-inspiring”. “You can see snow at the bottom but you can also see this black void,” she said. The reconnaissance team believes the length of the cave runs at least 2km (1.25 miles). It is also the largest known cave of its type. “Karsts” are parts of the landscape made up of limestone, with sinkholes, underground streams, and caverns. “Sarlacc’s Pit” is a “striped karst”, marble interbedded with rock units containing less marble, which gives the rock a striped look. Ms Hickson says the next step is organising a trip to explore the interior of the cave, which will be a highly technical endeavour due to the vertical drop into the pit and the water, snow and ice inside. She called being part of the team to visit the site for the first time “very rewarding”. “It shows you, you don’t know everything,” said Ms Hickson.